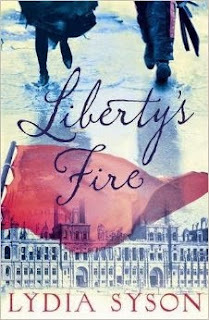 Liberty's Fire by Lydia Syson is another really fascinating, exciting and emotional story by one of my favourite recent authors. It's set in another historical time period that I knew nothing about and yet as I was reading this story, I was swept away into the lives of these four main characters and I found myself hugely emotionally invested in their lives and this Paris of 1871 that was under such tumult. Knowing nothing about the Commune of Paris, I knew absolutely nothing about what would happen but the build-up to that last 100 pages quickly grew as I was reading the story. Everything is gearing up towards something massive and knowing very little about the actual historical events meant that I was both on the edge of my seat and also hugely surprised by the turn of events that occurred. One of the major reasons that I love Lydia Syson's stories so much is because it really felt like this revolution in Paris was brought to life for me and it has been the same with her previous two books as well. These characters, their relationships to each other, the way in which everything happens: it all felt so real to me and I was definitely invested in each of the four characters' well-being. I felt like I understood them as people and while sometimes at the start of the story I felt shaky about the state of events politically in this story, by the end, I felt like I got it. Liberty's Fire tells us the story of what happens between March and May 1871 in Paris during a time of political upheaval when a new socialist political party called the Commune came into power. This story is told from four perspectives and through these perspectives the reader is able to see these events in a much broader way. The first main character, Zephyrine, is a teenage girl who has been looking after her poorly grandmother who passes away just as the Commune is taking over. Being all alone in Paris, Zephyrine worries about how she will feed herself and pay off her grandmother's bills. But she is soon swept away in the politics of this new party and becomes very passionate about the Commune's ideals of sharing the wealth and providing better social care and education for everyone. There is also Anatole and Jules, friends and roommates. Anatole, a violinist, meets and falls in love with Zephryine and becomes just as quickly wrapped up in her as with her politics. But Anatole's friends, Jules, a wealthy American photographer, and Marie, an opera singer worried about her brother, don't share this same enthusiasm. Zephyrine's experiences both with working with the Commune and also in her relationships with Jules and Anatole show off a great many things about what it was like for poor women in this time period. There is a great deal about the treatment of women here and also about the conditions of poor people which is a deep contrast to the ways in which Jules lives. I think Zephyrine's reaction to Jules' and Anatole's cat, Minou, is a great example of this. Jules is very well-off and is able to provide for Anatole and a pet during a time when the divide between working class and the wealthy is extreme. I really loved each of these characters and throughout the story I really got a sense for who they are and for what is important to each of them. I loved seeing the passion that each of these characters feels: Zephryine for this new radical movement. Jules for his photography and also Anatole. Anatole and his passion for music and Zephryine. Marie and her singing but also the welfare of her brother. When things kick off it is very interesting to see where these characters end up and to see where their passions and ideals lead them. I really loved this book. It was shocking and fascinating and just hugely emotional. I found every detail of this book to be really interesting: the importance of the photographs, the fear and uncertainty of women who have been raised to a higher political power, the ending. This book was such a rollercoaster ride of emotions for me and I highly recommend that you read it! I struggle with historical fiction sometimes but this - and Lydia Syson's other books - sound really accessible and interesting. Might have to give it a go!